Am I eligible for compensation for complications arising after injury in a St. Louis car crash? When you've been injured in a car crash in St. Charles, St. Louis or Clayton, you deserve compensation for all injuries caused by that accident. For example, if you were being treated for an injury from the crash, and that injury led to another injury or infection that required more medical attention, you should be eligible for compensation to treat that secondary injury as well. Of course, in most instances, you will have to fight to get the compensation you deserve. Insurance companies don't readily hand out money, so don't expect them to simply take your word for it and cut a check. This is especially true for those secondary injuries. The insurance agent in charge of paying medical bills resulting from the car accident may try to prove that any additional injuries were a result of medical negligence instead, thereby getting his or her own company off the hook for additional damages. The truth is that a serious St. Louis auto accident can often result in multiple injuries with complications that take several months to treat. If this is the case for you, be sure you are keeping a record of all your medical issues, the treatment for each of them, and all bills for that treatment. An experienced St. Louis car accident lawyer can help you prove the full extent of your injuries and what caused them. 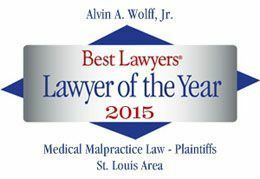 To request a free consultation or to order your copy of our book, The Guide on How to Pick a Lawyer, call Alvin Wolff at 314-241-2500 today.